As stated earlier, whether a machine is d.c. generator or a motor the construction basically remains the same as shown in the Fig. 1. It serves the purpose of outermost cover of the d.c. machine. So that the insulating materials get protected from harmful atmospheric elements like moisture, dust and various gases like SO2, acidic fumes etc. It forms a part of the magnetic circuit. It provides a path of low reluctance for magnetic flux. The low reluctance path is important to avoid wastage of power to provide same flux. Large current and hence the power is necessary if the path has high reluctance, to produce the same flux. b) Choice of Material : To provide low reluctance path, it must be made up of some magnetic material. It is prepared by using cast iron because it is cheapest. For large machines rolled steel, cast steel, silicon steel is used which provides high permeability i.e. low reluctance and gives good mechanical strength. Each pole is divided into two parts namely, I) Pole core and II) Pole shoe. Pole core basically carries a field winding which is necessary to produce the flux. It directs the flux produced through air gap to armature core, to the next pole. Pole shoe enlarges the area of armature core to come across the flux, which is necessary to produce larger induced e.m.f. To achieve this, pole shoe has been given a particular shape. b) Choice of Material : It is made up of magnetic material like cast iron or cast steel. As it requires a definite shape and size, laminated construction is used. The laminations of required size and shape are stamped together to get a pole which is then bolted to the yoke. The field winding is wound on the pole core with a definite direction. a) Functions : To carry current due to which pole core, on which the field winding is placed behaves as an electromagnet, producing necessary flux. As it helps in producing the magnetic field i.e. exciting the pole as an electromagnet it is called Field winding or Exciting winding. b) Choice of material : It has to carry current hence obviously made up of some conducting material. So aluminium or copper is the choice. 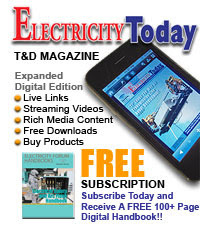 But field coils are required to take any type of shape and bend about pole core and copper has good pliability i.e. it can bend easily. So copper is the proper choice. Note : Field winding is divided into various coils called field coils. These are connected in series with each other and in such a direction around pole cores, such that alternate 'N' and 'S' poles are formed. By using right hand thumb rule for current carrying circular conductor, it can be easily determined that how a particular core is going to behave as 'N' or 'S' for a particular winding direction around it. The direction of winding and flux can be observed in the Fig 3. 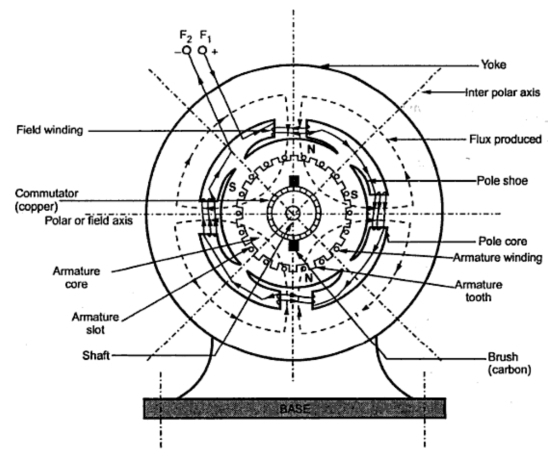 I) Armature core : Armature core is cylindrical in shape mounted on the shaft. It consists of slots on its periphery and the air ducts to permit the air flow through armature which serves cooling purpose. Armature core provides house for armature winding i.e. 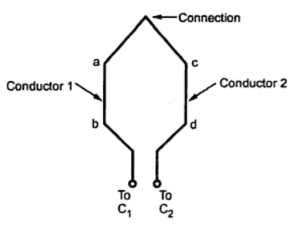 armature conductors. To provide a path of low reluctance to the magnetic flux produced by the field winding. b) Choice of Material : As it has to provide a low reluctance path to the flux, it is made up of magnetic material like cast iron or cast steel. It is made up of laminated construction to keep eddy current loss as low as possible. A single circular lamination used for the construction of the armature core is shown in the Fig. 4. II) Armature winding : Armature winding is nothing but the interconnection of the armature conductors, placed in the slots provided on the armature core periphery. When the armature is rotated, in case of generator, magnetic flux gets cut by armature conductors and e.m.f. gets induced in them. Generation of e.m.f takes place in the armature winding in case of generators. To carry the current supplied in case of d.c. motors. To do the useful work in the external circuit. b) Choice of material : As armature winding carries entire current which depends on external load, it has to be made up of conducting material, which is copper. Armature winding is generally former wound. The conductors are placed in the armature slots which are lined with tough insulating material. We have seen earlier that the basic nature of e.m.f. induced in the armature conductors is alternating. This needs rectification in case of d.c. generator, which is possible by a device called commutator. To facilitate the collection of current from the armature conductors. To convert internally developed alternating e.m.f. to unidirectional (d.c.) e.m.f. To produce unidirectional torque in case of motors. b) Choice of material : As it collects current from armature, it is also made up of copper segments. It is cylindrical in shape and is made up of wedge shaped segments of the hard drawn, high conductivity copper. These segments are insulated from each other by thin layer of mica. 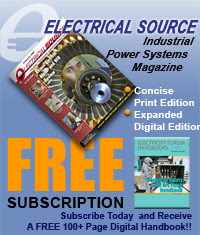 Each commutator segment is connected to the armature conductor by means of copper lug or strip. This connection is shown in the Fig. 5. Brushes are stationary and resting on the surface of the commutator. a) Function : To collect current from commutator and make it available to the stationary external circuit. b) Choice of material : Brushes are normally made up of soft material like carbon. Brushes are rectangular in shape. They are housed in brush holders, which are usually of box type. The brushes are made to press on the commutator surface by means of a spring, whose tension can be adjusted with the help of lever. A flexible copper conductor called pig tail is used to connect the brush to the external circuit. To avoid wear and tear of commutator, the brushes are made up of soft material like carbon. Ball-bearings are usually used as they are more reliable. For heavy duty machines, roller bearings are prederred. Good one you explain. all building and civil related work to must use for the pre engineering process is very well done to introduce. Majorly access material is boom lift rental for access and tools used for core work. Thanks for the opportunity. and Thanks for post.